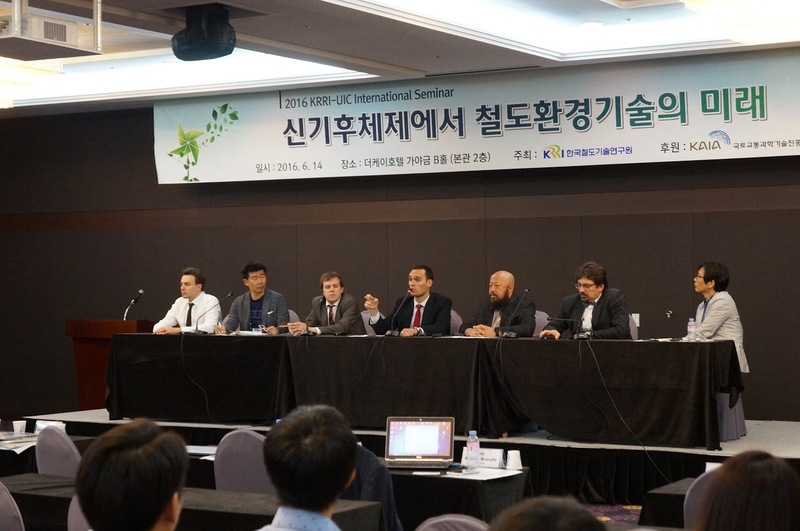 From 13 – 15 June 2016, Korea Railroad Research Institute (KRRI) and UIC organised a workshop dedicated to sustainable development strategy of railway industry in the presence of global warming, targeting researchers, academics and Korean rail experts. In partnership with the Korea Agency for Infrastructure Technology Advancement (KAIA), this workshop was a fruitful opportunity for UIC and KRRI working on these topics and representatives of the industry to exchange experiences on lasts technologies, best practices, procedures on the current environmental concerns as well as climate change mitigation and adaptation. The workshop started with deep discussion about vision of the Asia-Pacific Region of UIC 2050 and environmental issues of railway: noise, air quality, energy efficiency, soil remediation, between the UIC Sustainable Development Unit and environmental team of KRRI at their headquarters in Uiwang on 13 June. The following day, the international workshop under the title “Future of the railway environmental technology under neo climate change” was held in Seoul, inaugurated by Ki-Hwan Kim, President of KRRI, and Vincent Vu, Director of Institutional Relations at UIC and Coordinator of the UIC Asia-Pacific Region, who both provided a clearer picture of transport’s share, in particular rail, in sustainable development challenges and to express the need to make every effort to ensure a greener future. Both hosts acknowledged Korea’s commitment in this area for many years now. The workshop concluded with an open discussion where the participants exchanged their opinions about the existing main barriers and possibilities of implementing actions on these topics and KRRI made a commitment to put more emphasis on the technology of reducing carbon emission and raising energy efficiency of railway. After the workshop, a technical visit to the test track of the wireless tram was arranged to KRRI testing plant in Osong. This new wireless tram technology was developed by KRRI and awarded UIC research and innovation awards in 2014 and the participants had the opportunity to learn more about the latest projects and ongoing activities of Korea tram. This action ties in with the Railway Climate Responsibility Pledge signed by the UIC members in 2015 and that UIC wishes to promote and highlight – as with all those it will initiate in 2016.